Luan Quach began his journey in fine arts at the young age of 9. Luan receiving training from various styles of artists throughout his childhood gaining a solid foundation in drawing, sketching, charcoal, pastel, watercolour, and oil painting. This lead him to discover his true passion, a spark of joy in the art of portrait painting at the age of 14. Luan is truly a unique hybrid between both left and right sides of the brain. Although Luan has always had a strong passion for fine arts, a twist in his path lead him to an engineering career with a global automotive company. Spending decades in engineering, Luan specialized in programming robots to do one of the things he loves most: paint. Luan is also a certified Six Sigma Master Black Belt and is a freelance consultant and instructor in the field. Currently residing in the Greater Toronto Area with his wife and two children, Luan has regained full focus towards commissioned artwork, exhibitions, and holding workshops. 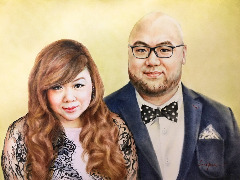 With extensive trial and research, Luan’s specialty now lies in portrait painting using an oil dry brush technique. 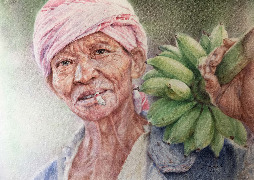 His art is done both in realism and impressionism styles, aiming to create timeless portraits with a modern twist. Every portrait holds a lifetime of stories. Luan’s goal is to spark curiosity and imagination with each and every piece he creates. Oil dry brush. Oil dry brush. Oil dry brush.